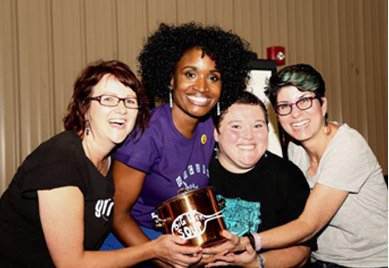 Girls Rock Roanoke was founded by LeeRay Costa, a Roanoke resident, Hollins University professor, and mother of an aspiring young rocker, and co-founded by Kim Jones Bratic, Roanoke resident, marketing maven, and mother of three. LeeRay and Kim, along with a core group of passionate volunteers, worked tirelessly to bring Girls Rock to Southwest Virginia in the summer of 2012.While GRR summer camp is our most noted event, our goal is to provide youth in the Roanoke area with programs, seminars, and musical instruction year round. We strongly believe that if a girl wants to rock, she should have the chance regardless of her financial status. This is only possible through the generosity and support of our corporate sponsors and individual donors. Girls Rock Roanoke is part of a national and worldwide movement to educate and empower girls and gender non-binary youth through music, creativity, and collaboration. The Girls Rock Camp movement began in 2001 with the establishment of the Rock ‘n’ Roll Camp for Girls in Portland, Oregon. 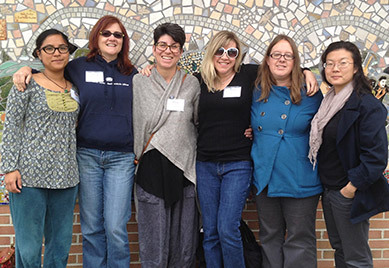 Today there are over 65 Girls Rock organizations worldwide that together form the Girls Rock Camp Alliance. In 2017 Girls Rock Roanoke moved into its new home at Theatre 3 in the Dumas Center for the Performing Arts, located in the Henry Street Historic District. The Dumas Center was originally the Hotel Dumas, built in 1916-17. It was a central component of Roanoke’s African-American neighborhood of Gainsboro. Many celebrated African-American artists and musicians performing at the theatre across the street stayed in the Hotel Dumas including Duke Ellington, Count Basie, Ethel Waters, Fats Waller, Cab Calloway, Dizzy Gillespie, and more. We are thrilled to be located in this historic building whose walls vibrate with the energy of these great artists and musicians, and to be able to offer workshops and events to the surrounding community. The Dumas Center is located at 108 First St. NW, Roanoke, VA, 24016. In 2017 Girls Rock Roanoke also announced the appointment of Lacey Levy as its first Executive Director. Mrs. Levy has worked with Girls Rock Roanoke since 2015. She has served the organization in a number of capacities including summer camp band assistant, organization volunteer, event planner, Volunteer Coordinator, and Year-round Program Coordinator. Mrs. Levy is excited about growing Girls Rock Roanoke through the development of year-round programming and community partnerships, and extending our reach throughout the Roanoke Valley. Mrs. Levy is passionate about music, education, and providing a safe space for our youth to develop their full potential.